Don’t be afraid of meeting design! 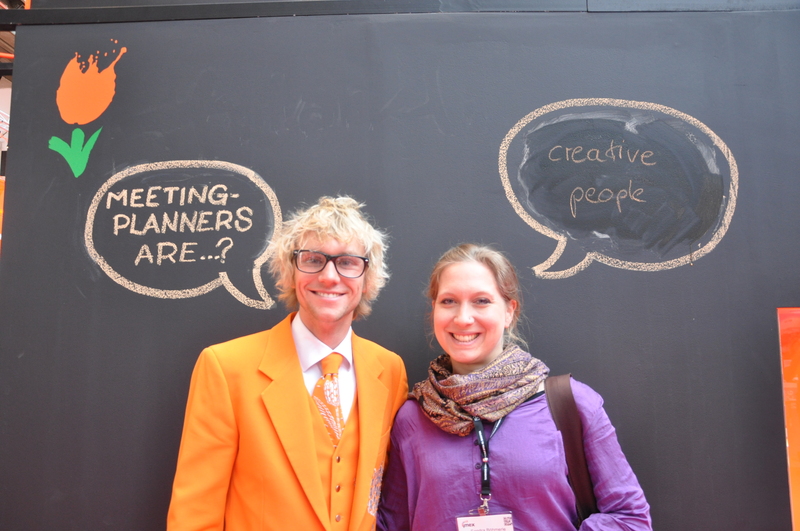 Have you met my friend Mike van der Vijver at IMEX in Frankfurt? 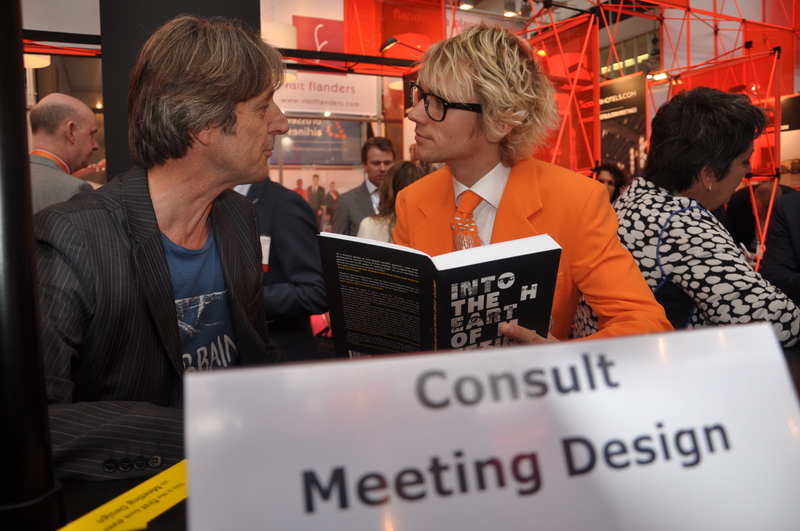 He is meeting designer and co-author of the book Into the Heart of Meetings. During the last weeks I dived into his book and was fascinated about the power and impact of well organized meetings. In my previous posts Mike told us a lot about the the importance and advantages of meeting design and I strongly believe that it belongs to the future of our industry. But why are so few people using this power? 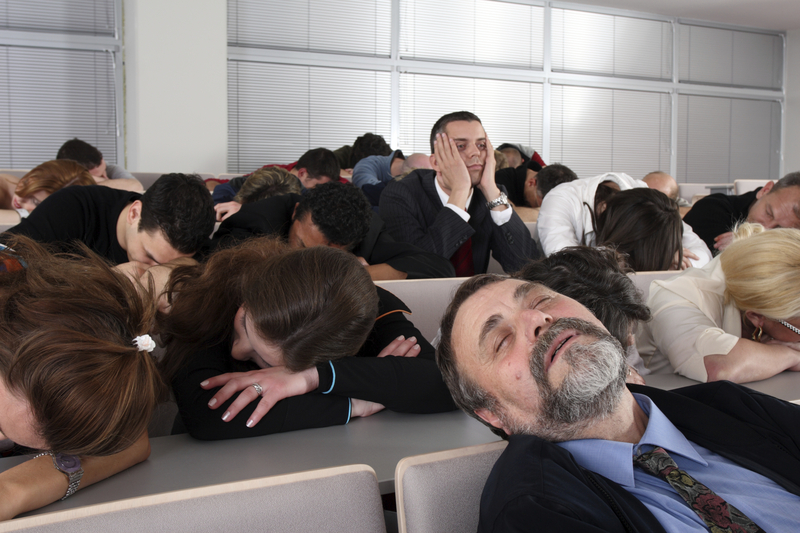 Why does the majority of meetings still resemble the atmosphere of a lecture room? Here are the main reasons why meeting design is not booming yet. Did you know that even small changes, like the way people are seated or the venue you choose can influence the outcome of your meeting? Many meeting planners think that their meeting would not allow dramatical changes. Planners who organize scientific conferences for instance are convinced that this type of meetings allows no other options. Mike tells us that there are enough alternatives that won’t change the character of the meeting but can improve the outcome and increase participant satisfaction. 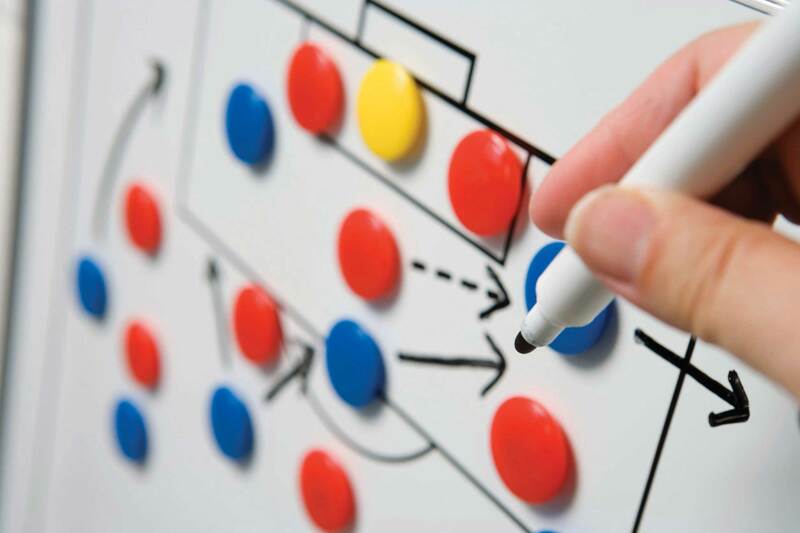 The meeting owner often pursues several goals when planning a meeting. One of them is maintaining the company’s identity and tradition. Therefore many meeting owner would not want to change their settings, since a failed experiment could harm the company’s good reputation. Better safe than sorry. But according to Mike, there is no need to worry. In most cases, participants will be glad if you present them something new. 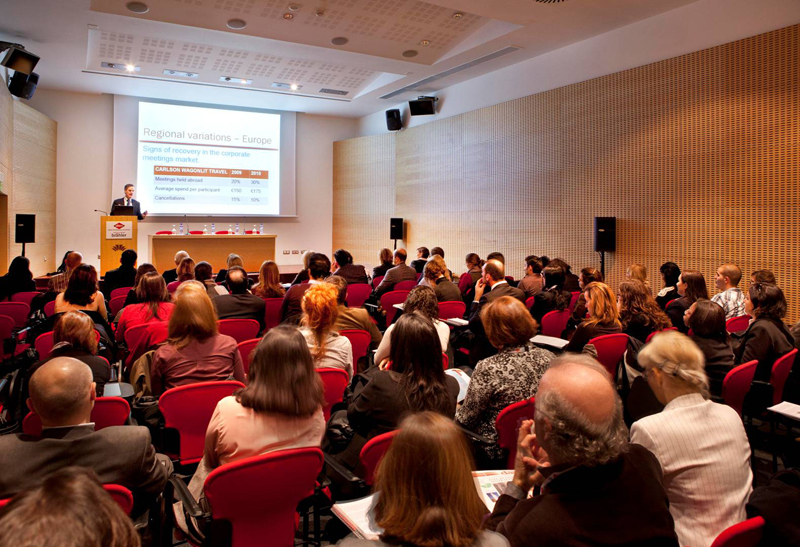 Speakers are content providers and therefore a crucial factor for meetings. But many of them like to see themselves in the role of an expert who transmits knowledge to a uniform audience. In the best case, the audience will be too polite to fall alseep. If you want to provide more exciting and engaging content you need speakers who are willing to leave the familiar powerpoint pathway and abandon their expert role. This requires an open attitude and courage to face a discussion without a predetermined story. So, do you dare to try something new? If we want better and more effective meetings we need to remove the traditional lecture room idea of meetings from our heads and be open for change. Your attendees will be happy if you try something new and satisifed participants are likely to come back for another meeting. But how can you do that? What are your experiences with meeting design? Please share them with me. I hope that you are fully recovered from the busy trade show days in Frankfurt. I think it’s time to look back at a great time with many great people. Here is my personal selection of IMEX shots. Which one is your favourite? I´ve been waiting so long for this day. Finally we are at Messe Frankfurt. I´m so excited, there it is! I met people from all over the world. This is one of the many pretty girls in pretty dresses I met. Chatting at the Switzerland booth. Caught in the act. I thought I could have a quick snack but the camera found me. Can you spell your name in Korean? That is mine… at least, that´s what they told me. Would you like to try a piece of original Dutch cheese? The orange spirit is all around here. And the talks are getting even better. It was really fun to meet and celebrate with you. Too bad that we could not prolong the show. We had the best hosted buyer groups of the show! I just really have the best partners in the world! Site shoot at our stand! So proud of my team at NBTC! 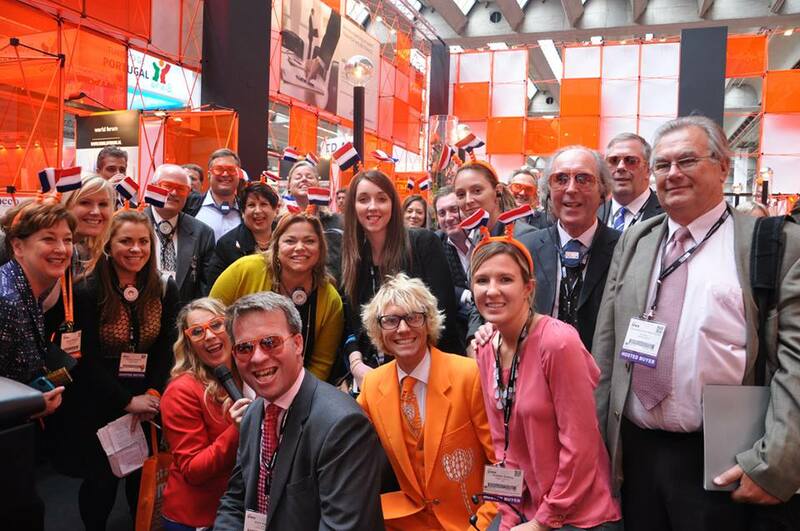 Good bye IMEX or ´Tot ziens´ as we say in Dutch. Will I meet you again next year? I hope that you all have arrived home safely and comfortably. It would be great if we could meet again in London, Las Vegas or Barcelona this year. Will you be there? Please let me know! 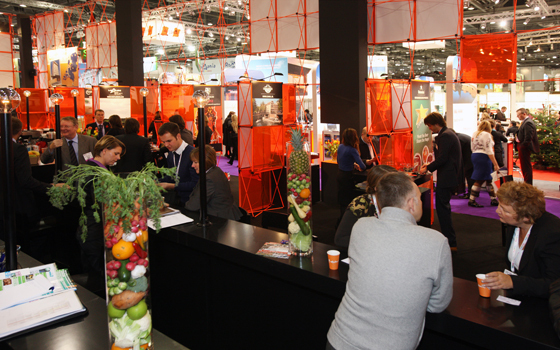 IMEX 2013 in Frankfurt is in full swing. 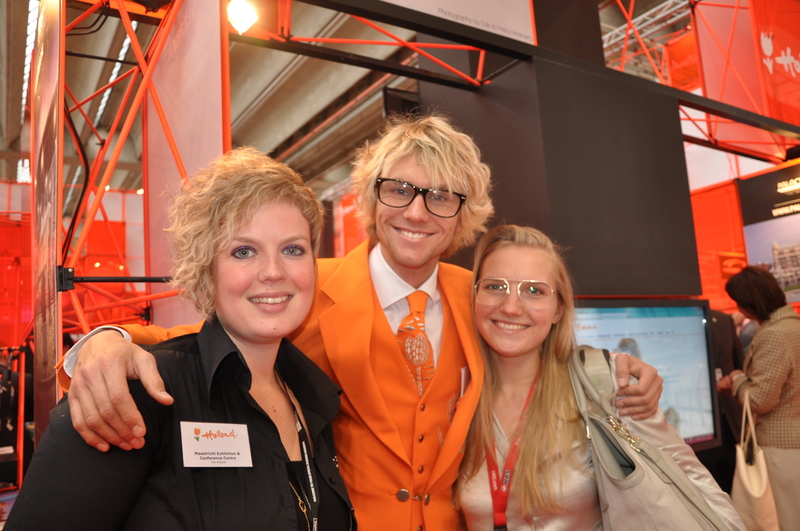 We are having a lot of fun at our Holland booth and I have met countless great people. Here are a some snapshots to give you an impression of what is going on here. 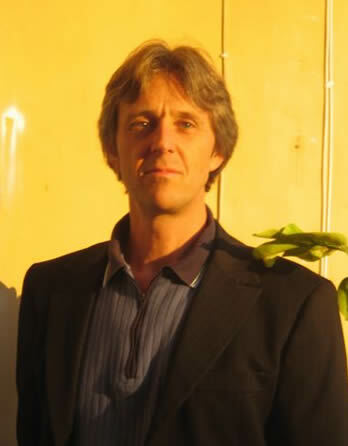 Have you met my friend Mike van der Vijver yet? He is here to answer all your questions about meeting design and give you tips to improve your meetings. Would you like to meet him? You can still schedule an appointment. Can you spell your name in Korean? Well, that’s mine. At least, that’s what they told me. What defines a meeting planner? We ask visitors to fill in the right speech bubble. What would your answer be? 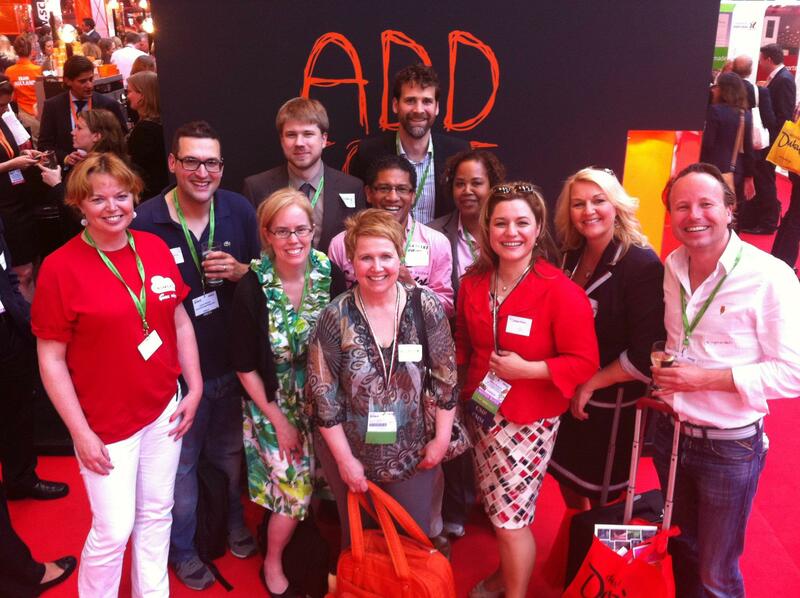 Are you coming to the IMEX tweet-up? It will start at 16.30 at my booth (E100). Be quick and register now. I wish you a great trade show. Maybe you still have time to pay me a visit? Looking forward to meeting you! Just a few days to go before the international meeting and event industry will gather in Frankfurt for IMEX 2013. I am really excited to meet you all, so just watch out for my orange suit and make sure that the Holland Meeting Point lies on your direction. We have prepared some orange specials for you. Have you already noticed the glasses in my new avatar? 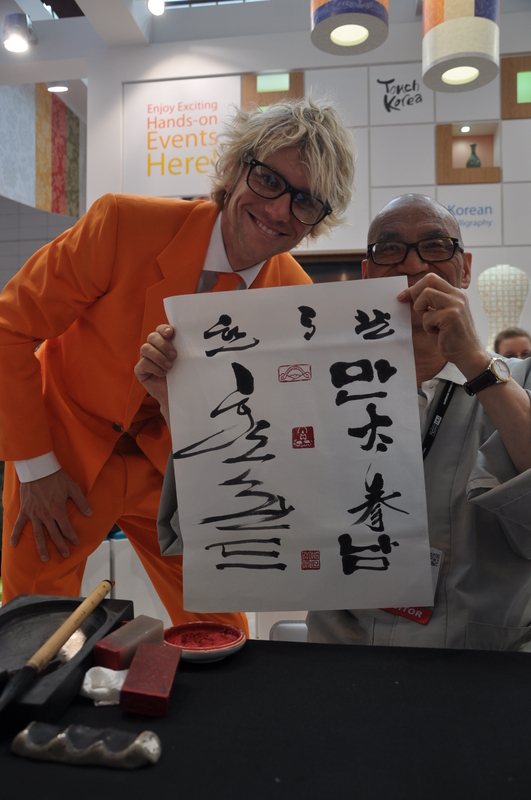 They are original Dutch design and I am wearing them because the Holland stand at IMEX13 will be devoted to meeting design. For this special occasion I will bring my friend Mike van de Vijver, meeting designer and co-author of the book Into the Heart of Meetings. Maybe my latest blogposts made you curious about Mike’s profession? You are welcome to ask him all your questions about meeting design. Just make an appointment with him. Wouldn’t it be nice to meet in Frankfurt and take a funny photo together? So, if you spot me just come over and we will pose for the camera. This photo might also be your ticket to win a copy of Mike’s book Into the Heart of Meetings. Once again we agreed to be the hosts for our 4th IMEX Tweet-up. Place: Holland Meeting Point (Stand E100). For questions your can contact the organizer: Anne Thornley-Brown, President, Executive Oasis International and Group Manager, Event Planning and Event Management on LinkedIn. There is space for a maximum of 40 people so please RSVP right here! On which days will you be at IMEX? I’d love to meet you, so if you are up to something send me a mail, tweet me or leave a comment. Mike, you said that you, as a meeting designer, could help create the right atmosphere at a meeting to promote the optimal outcome. But to which degree is it really possible to predict and influence human behaviour? Yes, that’s a tough question. It’s hard to imagine that you can have a real impact on that. Certainly, all human interactions are largely determined by people’s character and emotions, their mood and random incidents like a bad hair day, a traffic jam or unexpected good news. These are things you cannot influence. But what you can do is steer the dynamics of a meeting. I compare myself to a skipper on board of a ship on the ocean: I can’t do anything about the direction and force of the wind, the currents and the waves. Yet I control the ship’s course, the trimming of the sails, the waypoints and position. If I would ask you to design my next meeting, how would you start working? The first step is to get clarity on the objectives for the meeting. It may sound strange, but often the meeting objectives are quite vague and formulated in terms that do not relate to the experiences of the participants. We talked about participant experiences last week, too, remember? Then we do some qualitative participant interviews to obtain their views on the content. 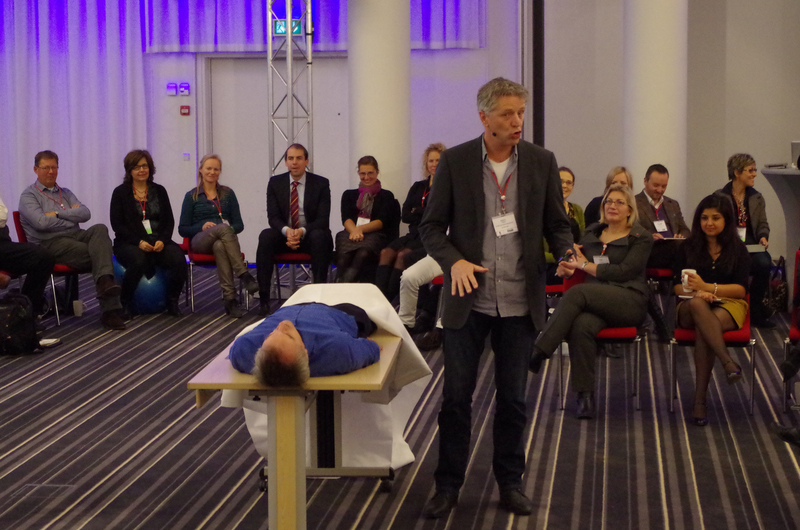 Next is an in-depth analysis of the content and how to make it ‘hot’, as we call it: gripping the participants. We end up with a script, a description of what content, providers and participants need to be doing, including the order and duration of each single programme item. It is important that we make this sketch with your goal in mind. Each activity should be planned in such a way that it has the desired impact on your participants – an impact that supports your goals. But how can I predict the impact of certain activity? This is an almost philosophical question. I believe that the answer lies in the theoretical approach of receptivity – the ability or willingness to change your own state in response to a stimulus. Every change in state creates a new situation with new receptivity conditions. As events unfold, this process of stimulus, response and change repeats itself countless times and many of these stimulus – response reactions are predictable. This is the domain of the meeting designer: to notice and predict changes in receptivity and steer them. And then design a programme that guides participants through the process in such a way that the objectives are achieved. Do you have more questions on meeting design? Would you like to learn more about meeting design? I will continue this interview with Mike in the next 2 weeks. But you can also ask the expert himself. Mike will accompany me to IMEX in Frankfurt to answer all your questions. There will be an online scheduling tool to make an appointment with him. Will you come and visit the two of us at IMEX? 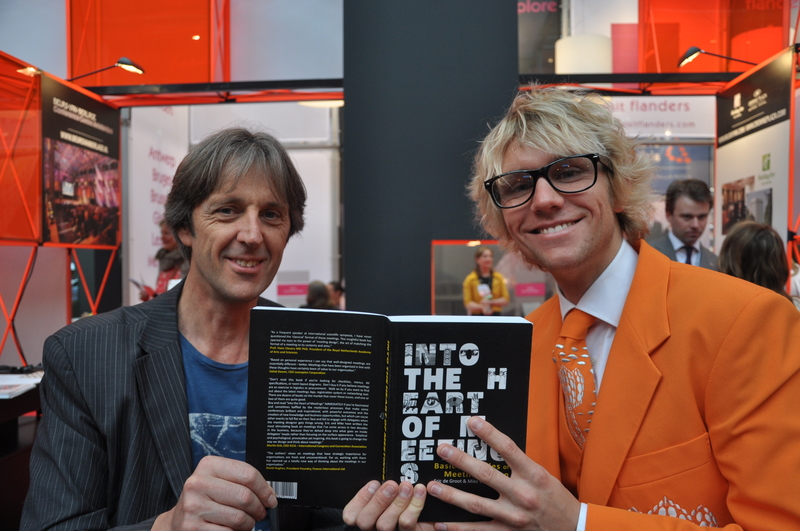 In my last post I introduced you to Mike van der Vijver, the Dutch meeting designer and co-author of the book Into the Heart of Meetings. After we explored how meeting design can improve the outcome of your meetings, we want to attend to the people who came up with the idea of having the meeting in the first place – the meeting owner. How can we translate the meeting owner’s purposes into a programme that satisfies both, him (the owner) and the participants? Mike, meeting planners know how hard it can be to unite the objectives of the meeting owner and the participants. How is it for the meeting designer? Indeed, it can be hard to organize a meeting that meets the goals of the meeting owner and the expectations of the participants. But they are like Yin and Yang, influencing the meeting like two parts of a mould in which some plastic component is formed. If one half is missing, the product will be useless. Therefore it is the job of the meeting designer to find a balance between their interests. We work closely together with the meeting owner on the explicit assumption that the participant is the most important person. How can you achieve that both parties will be satisfied in the end? It helps when the meeting owner understands that his meeting involves people and that it depends on these people whether he will reach his goals or not. If you bring people together in a place they will have physical and emotional experiences in response to your program, which influence how they will perceive and process the content and the entire meeting. If they perceive your meeting as boring, unpleasant and a waste of time you will not only fail to reach your goal. Their experiences will also label their attitude towards your company. You can compare this to a birthday party: if the host fails to amuse his guests they will leave (and probably not come a second time). So, if the meeting owner wants his meeting to be successful he has to put the participant in the first place. How can you help the meeting owner to produce content which is attractive and meaningful for your participants? When you design content for a meeting you must not only focus on the content itself. Your first concern has to be how the participant will process this content during the meeting when it enters their heads and encounters their individual expectations and experiences. So first you have to ask yourself: what do you want to happen to your content? The second step is to create content which is appealing to your participants. We handle for criteria for ‘hot’ content. First, good content is sticky, which means that it arouses basic human feelings like pain, fear or pleasure. Second, the content must have a certain impact on participant’s life. A story becomes much more interesting when you play a role in it. Third, hot content includes a conflict, a dilemma that has the capacity to trigger a discussion. Fourth: make them curious. Choose an angle of the topic that makes participants want to learn more. Would you like to learn more about meeting design? I will continue this interview with Mike next week. But you can also ask the expert himself. Mike will accompany me to IMEX in Frankfurt to answer all your questions. Please use the online scheduling tool to make an appointment with him.